Assault Android Cactus (AAC) is a pure, distilled, frantic, fast-paced, edge-of-your-seat ride that is elegantly constructed and lovingly crafted. Aussie developer Witch Beam should be applauded for absolutely nailing that fiendishly addictive, "one more go" feeling that twin-stick shooter stalwarts hunger for. Basically, AAC is awesome. Like, really awesome. 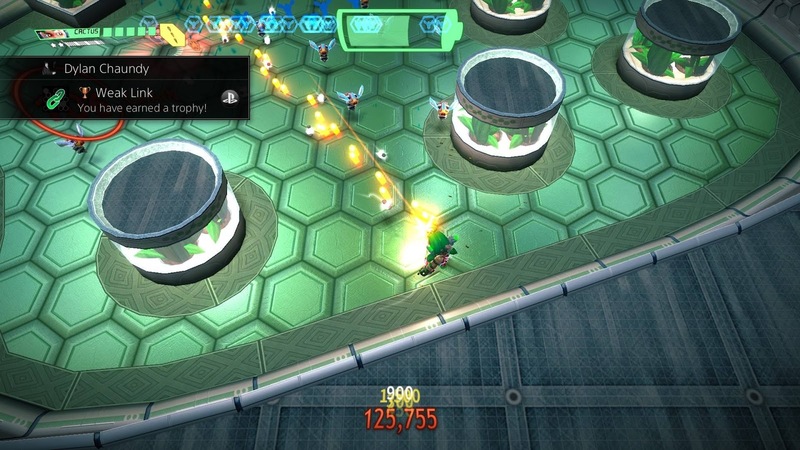 Related reading: Sam's review of the PC version of Assault Android Cactus. You begin the game as the titular Cactus, a sort of junior space cop of sorts. Cactus has been sent to investigate a distress signal from a civilian space freighter called the Genki Star. On her approach, the Genki Star begins to open fire on Cactus and in classic popcorn TV and movie fashion, Cactus' boss orders her to abort the mission and return to base. However, Cactus is the sort of chick that doesn't give up that easily. Instead, she does what any 80's hero would be proud to do; she smashes slap bang into the side of the Genki Star, lands on some unassuming, nasty robots and risks it all to save the day. Yep, it's cheesy and super 80's but in a really charming and deliberate way. The game is framed in a wonderful anime and saturday-morning-cartoon aesthetic which is, a lot like its gameplay, a splendid blend of Eastern and Western design philosophies. The story essentially boils down to a sort of robot uprising on the Genki Star and it's your task to put an end to it and vanquish those pesky robots. Now, let's cut to the chase, no-one really plays twin-stick shooters for their narratives and AAC is no different. It's a sublime twin-stick shooter that fuses together Western style arena shooting with Japanese style danmaku (or "bullet hell") and it does so with elegance and flair. This fusion of shmup sensibilities is most pronounced when you consider the game's accessibility, especially in a genre that is often regarded as punishing and uber-challenging. Don't get me wrong, AAC isn't necessarily easy, but compared to the likes of Deathsmiles, Kromaia Omega, Resogun or even Geometry Wars, it's a game that puts much less emphasis on getting hit and much more emphasis on just getting through in time. You see, the big difference in AAC is that you don't really have any lives as such, but instead you are reliant on batteries dropped by enemies to keep you fighting fit. When your battery runs out it's game over and it's this constant hunt for batteries that is one of the core mechanics of the game. In essence, AAC removes the unforgivable bite of bullet hell shooters and forgoes this for a more accessible take on the genre, as getting hit by a stray projectile does not mean game over. Heck, you can actually take five hits before you get knocked down, but getting back into the thick of it is just a few button taps away. Now, like I said earlier, it doesn't mean the game is easy. The more you get knocked down, the less chance you have of finding that all-important battery in time. The fact that the super important battery pick-up always seems to come just in the nick of time gives the game a wondrous edge-of-your-seat, sweaty-palms momentum to the high-octane gameplay. Nevertheless, when your battery does run out, it really does mean curtains closed. Well, for that stage anyway. The game is broken down into six zones. Each zone is made up of five stages with the fifth stage culminating in a boss battle. In addition to the standard dual-stick controls, you've got access to a powerful secondary weapon that must be used in short controlled bursts as it overheats quickly, but luckily its cooldown is pretty quick; it only takes a few seconds to charge up again. However, switching to your secondary weapon takes up about a portion of a second of your valuable time and when the screen is teeming with robots and bullets that want you dead, that time can be the difference between getting hit or getting by. At times it's not the enemies that prove to be the problem but the environments that you're dropped into. Walls that materialise out of thin air, floors that re-configure themselves under your feet and spinning lasers that take up a chunk of the screen, along with the plethora of rogue robots that are out to blast, bash and brutalise you, all come together to make for a downright dastardly experience - especially in the later zones. Though the game is accessible, the later levels still proved a challenge to yours truly. There are a litany of power-ups that enemies occasionally drop, from the tried-and-true "weapon overdrive" which temporarily boosts your damage output, to a "speed" pick-up that temporarily boosts your mobility, to a "freeze-time" pick-up that stops enemies in their tracks and gives you an opportunity to mop up the remaining hostiles with a moment of downtime. As you chew through the enemies, they also drop white energy orbs that level up your primary weapon. When you get knocked down, your weapon level gets reset, which gives you all the more reason to avoid those pesky bullets. Complementing the excellent campaign are two different modes; Infinity Drive and Daily Drive. Infinity Drive is a survival mode where you take on increasingly difficult waves of enemies, whilst Daily Drive is a randomly generated level that is changed daily, though you only have one chance per day to nail it. Both modes are lovely additions that help round out an already superb game. The icing on the cake however, is the game's co-op mode which can be played with up to three friends. It can get pretty damn hectic for sure, but it's a lot of fun and well worth a look if you have some friends and a few spare controllers lying around. There are nine unlockable characters to choose from and each character has a very different loadout that encourages different strategies; this gives the game meaningful replay value. The game also looks fantastic, runs superbly on PS4 and sounds great too with electro-techno flavoured beats supplementing the fast-paced arcade action. 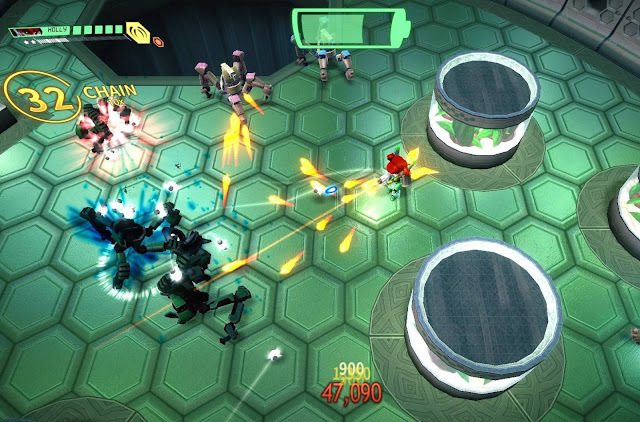 Related reading: An interview with the developer behind Assault Android Cactus from 2013. All that's left to say is this... Just. One. More. Go.